There is probably as many different types of cheesecake as you can imagine and maybe you have already found your favorite one. This is my number one. It’s based on a mixture of quark and Mascarpone and has a nice touch of white chocolate. 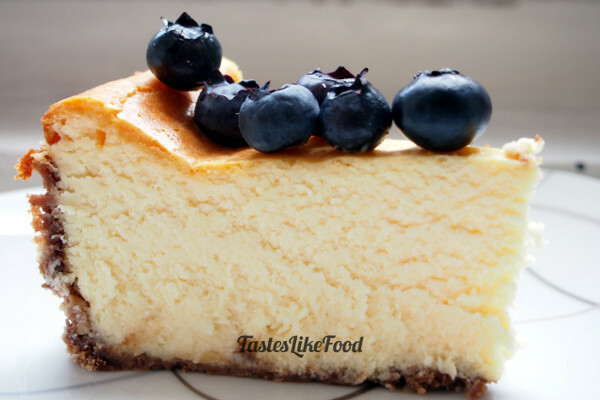 This cheesecake is rich and dense at the same time and it’s just sooo tasty. I love its creamy texture. Plus, it is super easy to make and even though it stays for a really long time in the oven, it remains moist and fluffy thanks to a teacake pan filled with water. There is just nothing that can go wrong with it. That is why it is on my ‘dead cert’ list when I am expecting guests and don’t want to experiment much, just serve something that will never fail and that everyone will love. Prepare a springform pan that is min 25cm in diameter. Blend the biscuits and walnuts in a food processor or with a hand blender until finely ground. Add the butter and a pinch of salt, and stir a few more seconds until well combined. Pour the blended biscuit mixture into the springform pan and gently press it down with your fingers until the crumbs form an even layer at the bottom and the sides of the pan. Put the pan in the fridge. In a mincer grind the quark twice. In a larger bowl combine ground cottage cheese with the Mascarpone. Add flour and sugar and grind again until the ingredients are well combined. Start adding eggs, one by one, while continuously grinding the batter. At the end add the yolk. Preheat the oven to 175°C. Boil water in a kettle and fill with it 3/4 of a small teacake pan. Place it on the bottom of the oven. Break the chocolate into pieces and melt it in a small saucepan together with the sour cream. Add around 10-15 Tbsp of cheese batter to the melted chocolate cream and stir. Then combine both creams. Pour the cheese cream into the springform pan filled with ground biscuits. 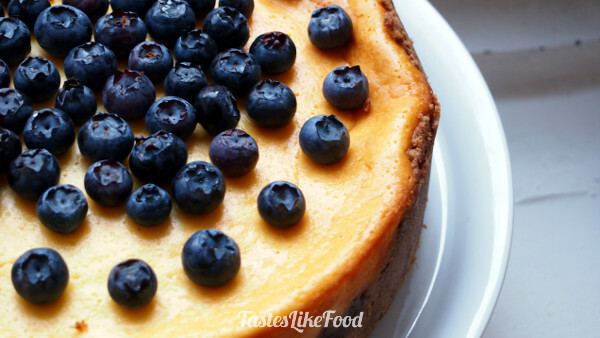 Bake the cheescake for 15min. After that reduce the temperature to 120°C and bake for 1h45min. Let the cheesecake rest on a rack. After cooling down, decorate it with fresh seasonal fruits.